My grandfather was a cyclist — I had no idea. 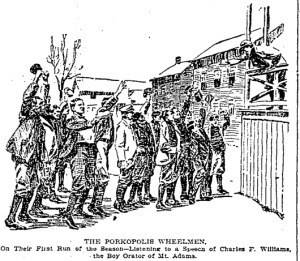 Charles F. Williams, who in 1910 was elected the head of Western & Southern Life Insurance Company in Cincinnati, was a member of the Porkopolis Wheelmen and made several century runs (100 mile rides) in his day. 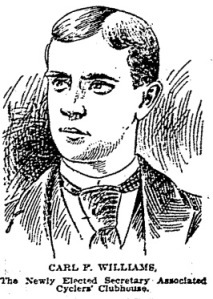 He was elected Secretary of the Associated Cyclers Clubhouse in 1896. He had an impressive collection of artwork, which included works by Sargent, Duveneck, and Van Dyke (among many others). It was said of him that throughout his life he ate simple fare and was kind to his workers. Here he is leaning over the porch rail of his father’s home in Mount Adams, rallying his club for a run in the country.